La bande originale de “L’âge de glace 5 – Les lois de l’Univers”. Sortie : 19 juillet 2016. 1. 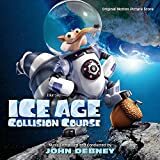 Ice Age: Collision Course Main Title – 0:15. 2. Cosmic Scrat-tastrophe – 2:42. 3. Earthbound Acorn – 0:41. 4. Family Bonding – 3:14. 5. Clingy Sid – 0:41. 7. Extreme Gravity – 1:22. 8. Did You Forget? – 1:34. 9. Peaches and Juilan – 0:59. 10. Meteor Shower – 2:43. 11. Ancient Temple – 1:37. 12. The Tablet – 2:36. 13. Dino Bird Plan – 1:51. 15. Electrical Storm – 2:54. 17. The Herd Rests – 1:06. 19. Crash Site – 1:44. 21. The Shangri-llama – 2:56. 22. A Good Life – 1:26. 24. Sealing The Volcano – 2:55. 25. Dino Birds Join The Mission – 3:15. 26. Julian’s Moment – 3:31. 27. We Did It – 2:25. 28. Wedding Preparations – 2:51. 30. Ice Age: Collision Course End Credits (Soundtrack Edit) – 0:51. 31. Dream Weaver (Performed by Trent Harmon) 3:49.